A few weeks ago I started reading the The Zuni Cafe Cookbook, which I recently reviewed. Every recipe sounds fantastic in the book. I love how the book doesn’t pretend that you can make really good food by taking short cuts. Some of the recipes in the book are thorough and long, but they all look so amazing, I couldn’t wait to try one. Betsy was feeling sick two weeks ago, so I thought I would make her one of the soup recipes from the book. I picked the stracciatelle recipe as it is fairly fast and looked very soothing. While the soup turned out fantastic, I have the distinct impression that if Judy Rodgers had been in my kitchen while I was making it she would have been hitting me over the head with a pan while yelling, “You are doing it all wrong!” In fact, I cannot even legitimately say that this is the recipe from the book. It is simply inspired by the book. 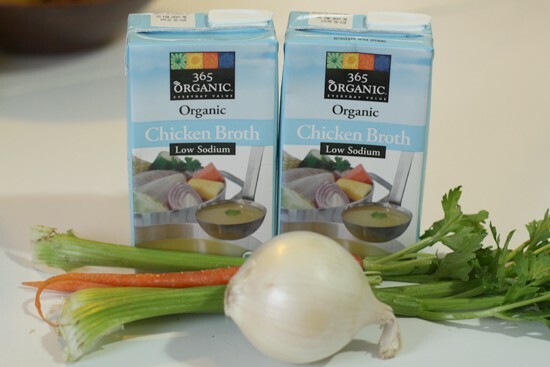 First, I used store bought chicken broth. Judy, I apologize, but I had a sick girlfriend on my hands and I didn’t have half a day to make your, I’m sure lovely, stock. I promise next time I will, but I needed this stuff right away. I usually try to have some frozen, but I ran out a few weeks ago and haven’t made more. Second, her recipe calls for sorrel leaves. I substituted spinach because I could not find sorrel leaves. Also, apparently they are a laxative and given that Betsy was sick, I didn’t want to cause any undo, ahem, strain. 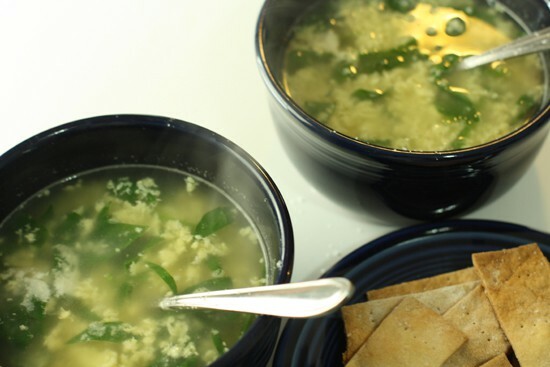 Spinach stracciatella is one of my favorite quick soups to make on a cold winter day. 1) If you’re using store-bought stock, I recommend simmering it with a few fresh veggies like an onion, some carrots, celery, parsley, and garlic to up the flavors a bit. If you simmer for about 30 minutes or so on low heat, lightly covered, it will really enhance the stock flavor. 2) Lightly whisk your eggs, semolina, and cheese together and wash your spinach. 3) Once your stock is simmering this takes just a minute. With your stock at a simmer, drizzle in your egg mixture. I find it best to drizzle so it doesn’t form lumps of egg. Once it is all added, then add your spinach or sorrel leaves and stir with a fork until everything is combined. 4) Taste it. Adjust salt and pepper levels and serve with bread and/or crackers. I also added some extra grated cheese. Recipe adapted from The Zuni Cafe Cookbook. I started this recipe with a problem. I actually don’t like store bought stock that much, especially in soup because that is really the entire flavor of the soup. You need good stock to make good soup. So I thought I would try to enhance my stock a bit by adding some fresh vegetables. I like low sodium stock if I’m going to buy stock because I can always add salt later. I poured my stock in a pan and added 1 onion, a few sprigs of celery, and a few carrots that had all been roughly chopped. I also threw in 10 peppercorns and a few sprigs of thyme I had in the fridge. I brought this all to a boil and then simmered it for 30 minutes. My goal was to give the stock some fresh flavor. I just didn’t have all night to do the chicken stock from scratch. I think this worked pretty well. The stock definitely took on some good flavors. It wasn’t perfect, but it would do just fine. While my demon-stock was simmering, I thought I would try to regain some of Judy’s respect (assuming she is still watching me in my kitchen) by making some homemade crackers for the soup. The dough is really easy to bring together. Add all of your dry ingredients together and then cut in your butter (I used my fingers). It should be evenly distributed throughout your flour in very tiny beads. Then mix in your water slowly until the dough comes together. 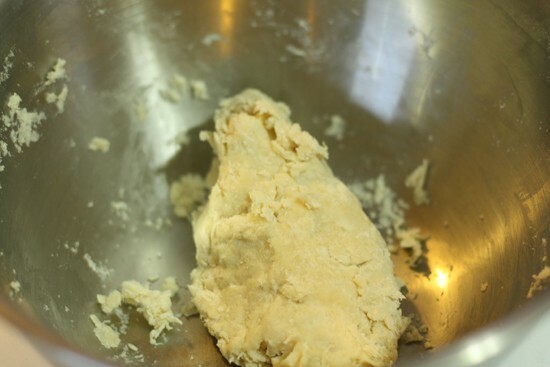 Throw this out onto a lightly floured surface and knead it a few times. 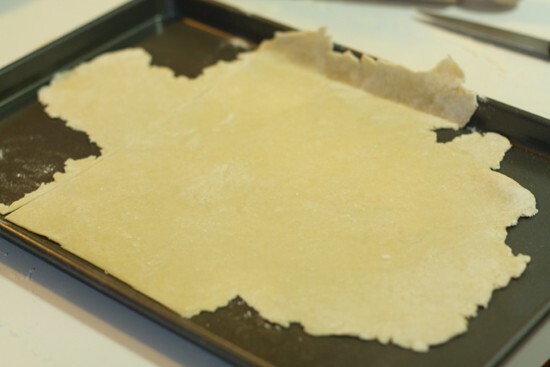 Then roll it out to at least 1/4 inch thick, but you can go thinner if you want. Then transfer to a baking pan. Score the dough with an knife or pizza cutter. 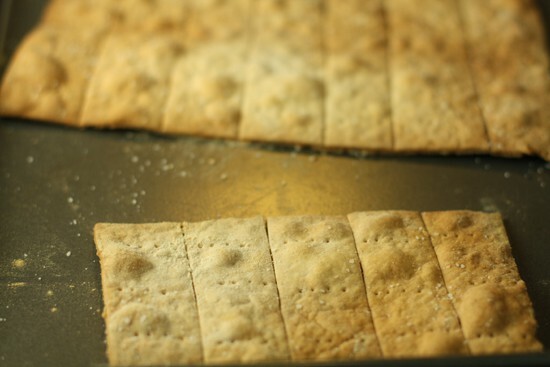 I also poked some holes in the dough with a fork to match normal cracker design and sprinkled some salt on top. Unfortunately, I also burned them. The ones on the left are okay, but the ones on the right are too done. They taste like burned flour. AKA… bad. It should only take them about 7 minutes to cook. Keep a close eye on them. Don’t go watch Seinfeld like I did. After about 30 minutes, you can strain off your veggies and bring your new enhanced stock to a simmer. Do not boil. Just simmer. Then prepare your additions. Lightly whisk your eggs, semolina, and cheese together and prep your spinach. The additions for the soup. This takes only a minute once your stock is ready. Yes. If you had good homemade stock, you could make this soup in probably 10 minutes. With your stock at a simmer, drizzle in your egg mixture. I find it best to drizzle so it doesn’t form lumps of egg. Once it is all added, then add your spinach or sorrel leaves and stir with a fork until everything is combined. Taste it. Adjust salt and pepper levels and serve. I also added some extra grated cheese in my soup near the end because, well, I love cheese. Unfortunately, the crackers were kind of a bust, but I think that was just because I burned them. The soup however was lovely. Even without homemade stock I thought it was very tasty. Betsy and I loved this so much, we actually ate it two days in a row. Update: It was brought to my attention by an astute Macheesmo reader (Nick from imafoodblog) that this dish is traditionally spelled stracciatella. I’m not sure why Judy spelled it differently, but she did. I’m keeping it the way she spelled it because I’m already on her bad side (the stock issue). If you want to see me demonize other very good recipes, you could sign-up for Macheesmo updates via RSS or Email! yummmmmmmmmm, I want some of this right now! you should make it again for dinner tonight, you don't really need to go watch bball, do you? This is like Italian egg drop soup. 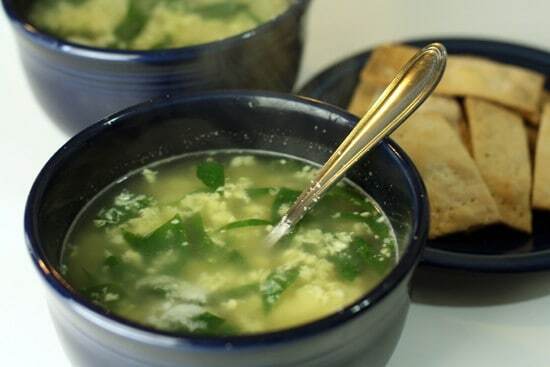 I only recently even heard of this soup when my dad ordered some at an Italian restaurant, it was so good, and I am sure your soup was delicious as well. I will keep this in mind the next time I am in the mood for some soup. what an amazing blog. you have me drooling. mmm…it's cold here, sounds like a good warm up. Been meaning to make one of these lil guys for a bit, yours looks tasty. If I was in your position, I would've told Betsy that you slaved for hours over a hot stove and worked your little arse off putting it together for you – you'll never know when you'll need those extra brownie points. FYI: They sell sorrel leaves at the WF on P St. – though maybe not year round, I've only bought them a handful of times. Hmmm, sounds good. What's the temp on the crackers? 450? Are you sure no baking powder? @Sam, yeah. 450 on the temp. The original recipe didn't have baking powder. They are a flat cracker. I think it I made them again, I might add some though to lighten them up a bit. this looks so comforting and I love the homemade crackers! Found you from Tastespotting! It looks delicious, cheat-stock or not. I'm sure your girlfriend appreciated it! Well, I have the homemade stock, but no sorrel or spinach, so I'm going to try this with arugula! 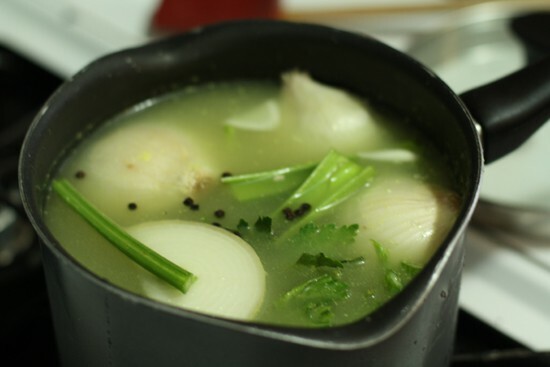 i love this soup and make it often. It is a great quick dinner and comfort soup. « Technicolor Bean Salad Recipes Home » Around the Internet Kitchen: Spring Time!